Citizens and scientists often see science-related topics issues through different sets of eyes. This is hardly a new reality, but there are particularly stark differences across the board in these surveys. The largest differences are found in beliefs about the safety of eating genetically modified foods. Fully 88% of AAAS scientists say it is generally safe to eat genetically modified (GM) foods compared with 37% of the general public who say the same, a gap of 51 percentage points. Sizable opinion differences occur on both biomedical science as well as physical science topics: Only two of the 13 comparisons find a difference of less than 10 percentage points. There is no single direction of differences between the groups. For example, when it comes to building more nuclear power plants scientists are more inclined than the general public to favor the idea (65% vs. 45%, respectively), while when it comes to increasing the use of hydraulic fracturing scientists are less inclined than the general public to favor the idea (31% vs. 39%, respectively). The remainder of this chapter looks at attitudes of the public and scientists on each of these issues. In addition, we look at opinions on several issues asked only of the general public related to bioengineering, genetic modifications, and perceptions of scientific consensus on evolution, climate change, the creation of the universe, and health effects of genetically modified organisms (GMOs). Throughout, we briefly evaluate patterns in science and technology attitudes by gender, age, race/ethnicity and education. More details on views among the general public by subgroups, including by education, science knowledge, religion and political groups, are forthcoming in a separate report. A minority of adults (37%) say that eating genetically modified foods is generally safe, while 57% say they believe it is unsafe. 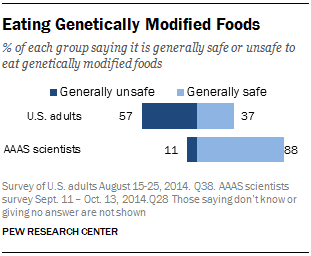 By contrast, nearly all AAAS scientists (88%) say they consider eating GMOs to be generally safe. 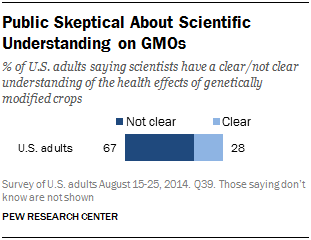 The general public also tends to be skeptical about the scientific understanding of GMO effects. A minority of adults (28%) say they think scientists have a clear understanding of the health effects of genetically modified crops while 67% say their view is that scientists do not clearly understand this. Among the general public, those with a college degree are closely divided over whether eating genetically modified foods is safe: 49% of those with college degrees say it is generally safe, while 47% say it is generally unsafe. Those with a college degree are still substantially less likely than AAAS scientists to consider GM foods safe to eat, however (49% compared with 88%). 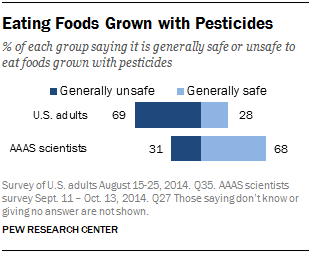 Fewer women (28%) than men (47%) believe eating GM foods is safe. Opinions also tend to vary by race and ethnicity with fewer blacks (24%) and Hispanics (32%) than whites (41%) saying that GM foods are safe to eat. Views about GMOs are roughly the same among both younger (ages 18 to 49) and older (50 and older) adults. 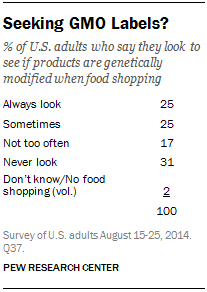 About half of U.S. adults report that they always (25%) or sometimes (25%) look to see if products are genetically modified when they are food shopping. Some 31% say they never look for such labels and 17% say they do not often look. Not surprisingly, those who consider GM foods unsafe tend to check for GM food labels more often: 35% of this group always looks to see if products are genetically modified, compared with 9% among those who consider such foods generally safe to eat. The general public is closely divided when it comes to the use of animals in research. Some 47% favor and a nearly equal share (50%) oppose animal research. Support for the use of animals in research is down slightly from 52% in 2009. 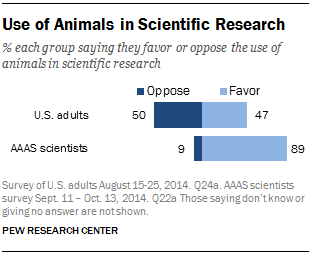 By contrast, there is strong consensus among AAAS scientists for the use of animals in research (89% to 9%). Among the general public, men and women differ strongly in their views about animal research. Six-in-ten men favor the use of animal research. By contrast, 35% of women favor animal research while 62% oppose it. College graduates, especially those who studied science in college, tend to express more support than do those with less education for using animals in scientific research. A similar pattern occurs when it comes to the safety of eating foods grown with pesticides. About seven-in-ten (69%) adults say that eating such foods is generally unsafe, while 28% say it is safe. By contrast, 68% of AAAS scientists consider eating foods grown with pesticides to be generally safe, and 31% say it is generally unsafe. As with views about the safety of eating GM foods, those with more education are more likely than those with less schooling to say that foods grown with pesticides are safe to eat. And, more men than women say such foods are safe, though a minority of both groups consider eating foods with grown with pesticides to be safe (38% among men and 18% among women). There are no differences in views on this issue by age. About two-thirds (65%) of Americans say that “humans and other living things have evolved over time” while 31% say “humans and other living things have existed in their present form since the beginning of time.” Public beliefs about human evolution are similar to when asked in previous Pew Research surveys, including the 2009 poll. Roughly half of those who say that humans have evolved over time believe that evolution has occurred from natural processes such as natural selection (35% of all adults), while a somewhat smaller share (24% of all adults) believe a supreme being guided the evolution of humans and other living things. Three-quarters (75%) of college graduates believe that humans have evolved over time, compared with 56% of those who ended their formal education with a high school diploma or less. 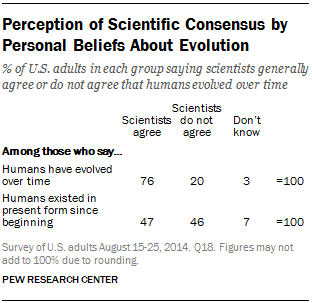 Beliefs about evolution also differ strongly by religion and political group, as was also the case in past surveys. A detailed analysis of religious and political group beliefs about science and technology topics based on these new survey findings is forthcoming. Regardless of their personal beliefs about evolution, 66% of the public say they believe that scientists generally agree that humans have evolved over time while 29% say that scientists do not agree about this. About half (47%) of those who personally believe that humans have existed in their present form since the beginning of time also see scientists as generally in agreement that humans have evolved. 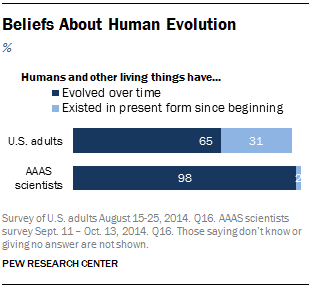 Three-quarters of those who believe humans have evolved also see scientists as largely in agreement about evolution. Perceptions of scientific consensus around the creation of the universe are less uniform. Some 42% of the public as whole says that scientists generally agree the universe was created in a single event often called “the big bang,” while 52% say that scientists are divided in their views about creation of the universe. 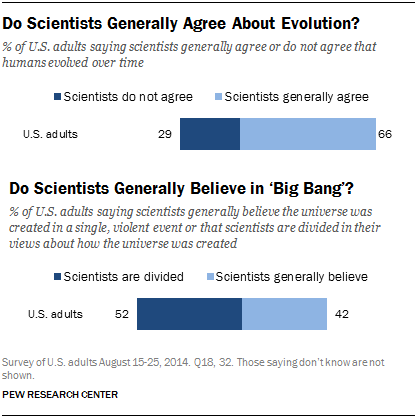 Perceptions of scientific consensus on both evolution and the creation of the universe tend to vary by education. About three-quarters of college graduates (76%) say scientists generally agree about evolution, compared with 58% of those with a high school education or less. Similarly, about half of those with a college degree (52%) say that scientists generally believe the universe was created in a single, violent event compared with 33% of those with a high school degree or less education who say the same. Perceptions of scientific consensus also tend to vary by age with younger generations (ages 18 to 49) more likely than older ones to see scientists as in agreement on these topics. Asked about whether vaccines for childhood diseases such as measles, mumps, rubella (MMR) and polio should be required or left up to parental choice, 68% of adults say such vaccines should be required while 30% say that parents should be able to decide whether or not to vaccinate their children. Scientists are more likely than the general public to say that such vaccines should be required for all children: 86% of scientists say this compared with 68% among the general public. Opinion about childhood vaccines among both the public and scientists is about the same as in 2009. 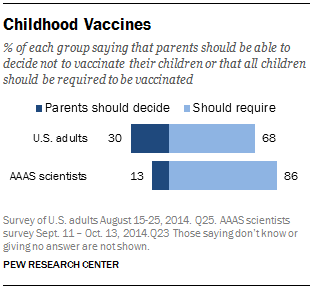 Scientists are a bit more likely to say that vaccines should be required (up from 82% to 86% today). Thus the divide between public and scientists’ views has ticked up from 13 to 18 percentage points today. Younger adults are less inclined than older generations to believe vaccines should be required for all children: 37% of adults under age 50 say parents should be able to decide not to vaccinate their children compared with 22% of those ages 50 and older. Men and women hold similar views about requiring vaccines. There are no significant differences in views about this issue by education or race and ethnicity. Public attitudes about climate change have become increasingly contentious over the past several years. The new Pew Research survey included two separate measures to gauge public attitudes about climate change. When asked to pick among three choices, 50% say that climate change is occurring mostly because of human activity such as burning fossil fuels, 23% say that climate change is mostly because of natural patterns in the earth’s environment, and another 25% say there is no solid evidence the earth is getting warmer. 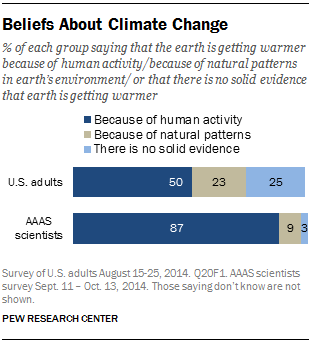 The share of the public saying climate change is due to human activity is about the same as when last asked in a 2009 Pew Research survey, but more now say there is no solid evidence of warming (25% today, up from 11% in 2009) and fewer say that warming is occurring due to natural patterns in the environment (23% today, down from 36% in 2009). 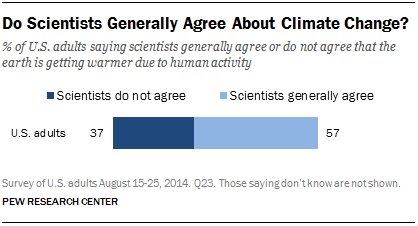 Scientists are also considerably more inclined than the general public as a whole to see climate change as a problem. 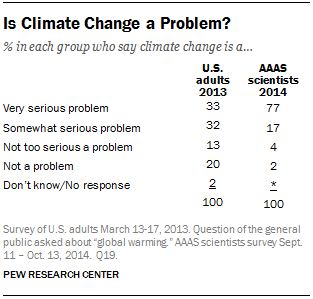 Fully 77% of AAAS scientists say that climate change is a very serious problem. 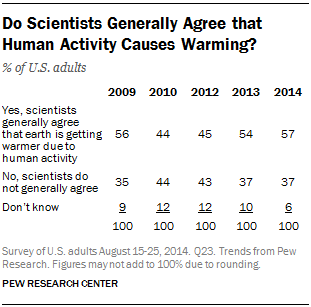 In a 2013 Pew Research survey, a third of adults said that “global warming” was a very serious problem. The highest share of those holding that view since the question was first asked in 2006 was 45% in 2007. There are a number of ways to canvass opinion about climate change issues. In a separate series of questions, adults in the general public were asked whether or not there is solid evidence that the average temperature of the earth has been getting warmer over the past few decades. 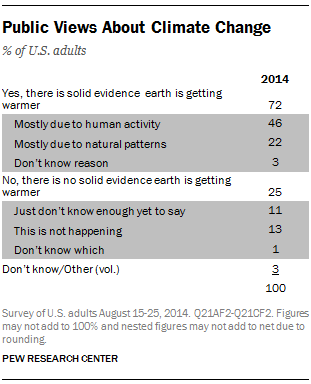 Fully 72% of adults say there is solid evidence of warming, while a quarter (25%) say there is no solid evidence of this. Follow-up questions find that most of those who believe the earth is warming think warming is due to human activity (46% of all adults), rather than natural patterns in the earth’s environment (22% of all adults). Those who say there is no solid evidence the earth is getting warmer are split between those who say the evidence is not yet clear (11% of all adults) and that warming is not occurring (13% of all adults). 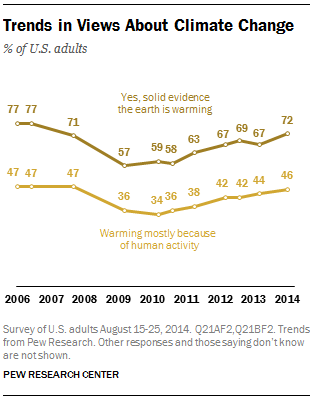 Americans’ views of the evidence related to climate change have fluctuated somewhat over the last few years. Since 2012, roughly two-thirds or more of Americans see solid evidence the earth is warming, up from roughly six-in-ten in 2009 to 2010. But when the Pew Research Center asked this question in August 2006 and early 2007, 77% said there was solid evidence that the average temperature on earth had been increasing. Views about the role of human activity in climate change have followed a similar trajectory. Consistent with past surveys, there are wide differences in views about climate change by age, with adults ages 65 and older more skeptical than younger age groups that there is solid evidence the earth is warming. These public perceptions tend to be associated with individual views on the issue. For example, those who believe the earth is getting warmer due to human activity are most inclined to see scientists as in agreement on this point. Those who say either that climate change is occurring due to natural patterns in the earth’s environment or who do not believe there is solid evidence of climate change are more inclined to see scientists as divided. As with perceptions of scientific consensus on other topics, public perceptions that scientists tend to agree about climate change tend to vary by education and age. College graduates are more likely than those with less formal education to say that scientists generally agree the earth is getting warmer due to human activity. Younger generations (ages 18 to 49) are more likely than older ones to see scientists in agreement about climate change. A majority of Americans express concern that world population growth will strain the planet’s natural resources: 59% of adults have a pessimistic view about the effect of population growth saying it will be a major problem because there will not be enough food and resources to go around. Nearly four-in-ten (38%) take the view that growth will not be a major problem because the world will find a way to stretch its natural resources. By comparison, AAAS scientists are particularly likely to express concern about world population growth and natural resources. 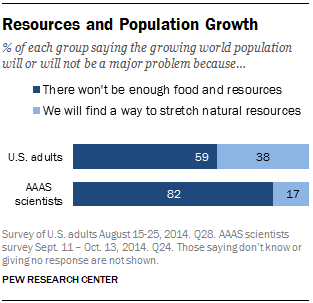 Fully 82% say population growth will be a major problem while 17% say this will not be a major problem because the world will find a way to stretch its natural resources. African-Americans are more optimistic that new solutions will emerge to address the strains on natural resource caused by a growing world population. Whites and Hispanics, by comparison, are more likely to see the growing world population as leading to a major problem. There are no differences or only modest differences in viewpoints about this issue by gender, age or education. About half of Americans (52%) favor allowing more offshore oil drilling in U.S. waters, while 44% are opposed. 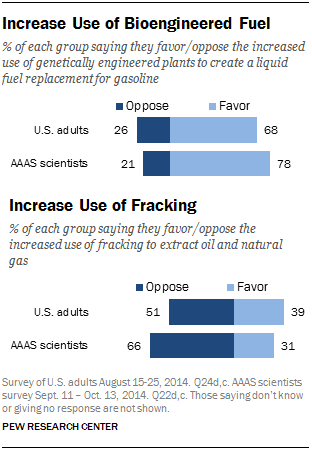 By contrast, most AAAS scientists oppose more offshore drilling by a margin of 66% to 32%. The opposite pattern occurs in views about nuclear power. About half of Americans (51%) oppose building more nuclear power plants, while 45% are in favor. 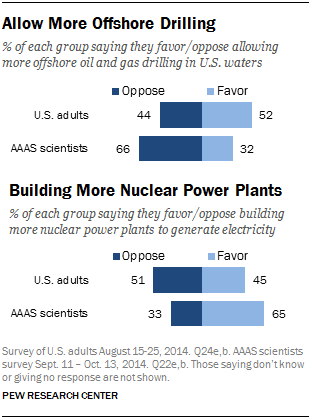 AAAS scientists show more support for nuclear power: 65% favor building more nuclear power plants while 33% are opposed. A majority of scientists support more nuclear power plants regardless of disciplinary specialty. One newer form of energy development — increased use of genetically-engineered plants as a fuel alternative to gasoline — draws strong support among both the public and AAAS scientists. Fully 68% of Americans and 78% of AAAS scientists favor increased use of this technology. Views about the increased use of hydraulic fracturing or ”fracking” tilt in the opposite direction. A minority of the public (39%) supports the increased use of fracking to extract oil and natural gas from underground rock formations, while about half (51%) are opposed. By comparison, opinion about fracking among AAAS scientists is more negative: 31% of scientists favor the increased use of fracking while 66% are opposed. However, scientists’ views about fracking vary across specialty areas. Engineers are more supportive of the increased use of fracking (53% favor) while those with biological or medical specialties are less supportive (25% favor). Those with a specialty in the earth sciences fall somewhere in between these two groups (42% favor). Men express more support than women for building nuclear power plants, more offshore drilling, and increased use of fracking. Both men and women hold about the same views when it comes to bioengineered fuel alternatives from plants. There are no or only modest differences by education on these energy issues. Many Americans, particularly those among the older generations, recount memories of the “space race” era and the historic events of NASA’s Apollo 11 landing a manned aircraft on the moon in 1969.22 NASA’s space shuttle program, which helped build the International Space Station, came to an end in 2011. A majority of Americans see the space station as a good investment for the country: 64% say the space station has been a good investment, 29% say it has not. 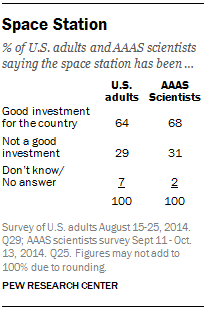 Views among AAAS scientists are also broadly positive: 68% of scientists say the space station has been a good investment for the country and 31% dissent from that view. While sending humans into space has been a prominent feature of the U.S. space program in past decades, the future role of human astronauts in the U.S. space program is unclear.23The Pew Research survey asked respondents to consider whether the use of human astronauts in the U.S. space program is essential or not essential given the relative costs of manned vs. robotic space exploration. 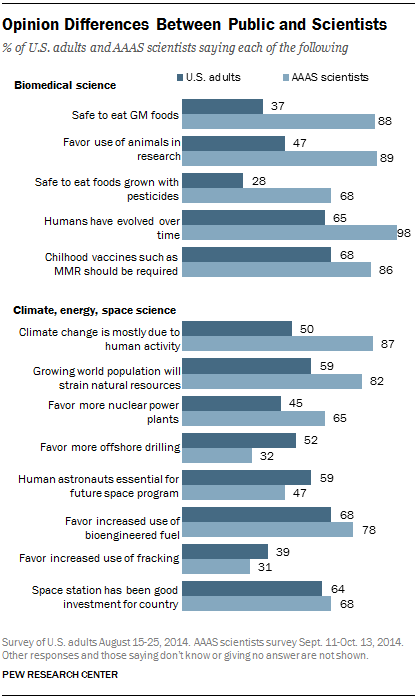 A majority of Americans (59%) take the view that human astronauts are an essential part of future U.S. space exploration. 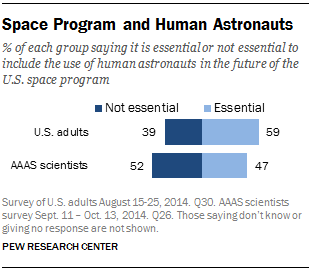 AAAS scientists, by contrast, are closely divided over whether or not human astronauts are essential in the space program going forward; 47% say that human astronauts are essential while 52% say they are not essential. There are only modest differences among scientists by specialty area about this issue. Among those who identify their specialty as physics or astronomy 41% say human astronauts are essential and 58% say they are not essential for the future U.S. space program. Men are more likely than women to say that human astronauts are essential for the future of the U.S. space program (66% vs. 52%, respectively). Views about this issue are roughly the same among age, education racial and ethnic groups. Some 59% of whites favor this idea, compared with about half of Hispanics (48%) and 36% of African-Americans.25 College graduates and those with higher family incomes tend to be more strongly in favor of this idea than are those with less education or income, respectively. 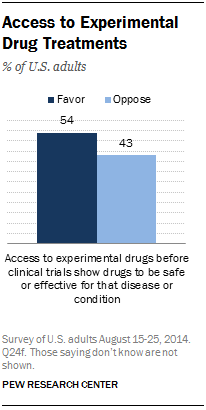 Men and women are about equally likely to favor increased access to experimental drugs before clinical trials are complete, as are those under and over age 50. New technologies in science and medicine are generating an increasingly wide array of medical treatments. One such treatment involves creating artificial organs such as hearts or kidneys for transplant in humans needing organ replacement. The Pew Research survey asked the general public (but not the AAAS scientists) whether or not they felt the use of bioengineering to create artificial organs was an “appropriate use of medical advances” or was “taking such advances too far.” Fully 74% of adults say that bioengineering of organs is appropriate while 23% say this is taking medical advances too far. Whites are more inclined than African-Americans and Hispanics to say bioengineered organs are appropriate, although majorities in each of the three groups say this is appropriate. There are also modest differences in views about this issue by education and gender; college graduates more so than those with less education say bioengineering of organs is an appropriate use of medical advances. In addition, men more than women say bioengineered organs are an appropriate use of medical advances. The survey also asked the public about two possibilities in the realm of genetic modifications. One question sought people’s views about changing a baby’s genetic characteristics in order to make the baby more intelligent. A separate question asked about changing a baby’s genetic characteristics in order to reduce the risk of serious diseases. Public views about the appropriateness of genetic therapies of this sort differ widely depending on the circumstances considered. 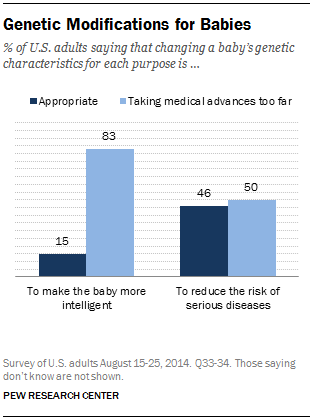 An overwhelming majority of adults (83%) say that modifying genetic characteristics to make a baby more intelligent is “taking medical advances too far.” Just 15% say this would be an appropriate use of medical advances. By comparison, fewer are negative about genetic treatment to reduce the risk of serious diseases. But opinion about this circumstance is closely divided, with about half of adults (50%) saying genetic changes for this purpose would be taking medical advances too far and a nearly equal share of 46% saying this would be an appropriate use of medical advances. Women are a bit more negative than men about genetic modifications to reduce the risk of serious diseases (54% among women vs. 47% among men say this would be taking medical advances too far). Strong majorities of both men and women are opposed to modifications aimed at increasing a baby’s intelligence, although opinion is more negative among women (87%) than it is among men ( 78%). There are no differences, or only modest differences, in views about genetic modification in these circumstances by race, ethnicity, or education. Younger and older adults also tend to hold similar views on these questions However, those under age 30 are a bit more likely than older adults to say that changing a baby’s genetic characteristics in order to reduce disease risk is appropriate.